“As more and more results come in, the Prin @ the Polls newsroom becomes more hectic,” students tweeted midway into over five hours of live election coverage on November 8. 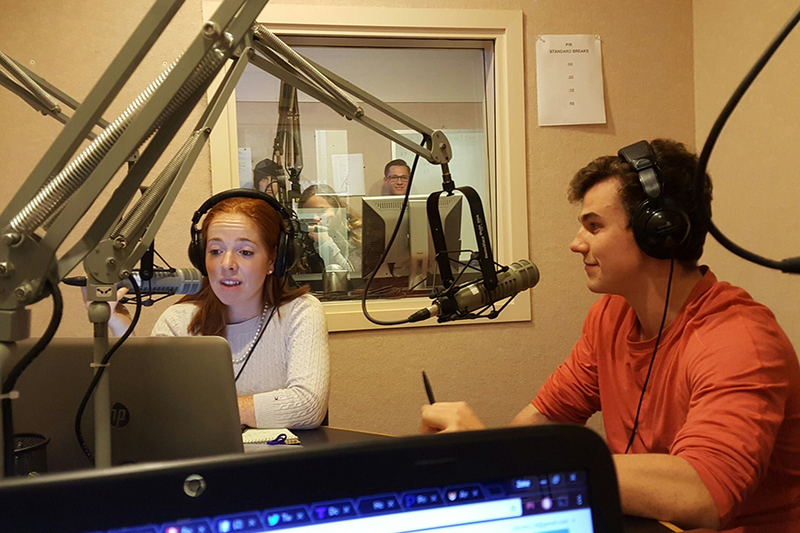 Approximately 75 students participated in the broadcast, with the Principia Internet Radio (PIR) and the PCTV studios providing a collaborative learning laboratory for students in political science and mass communication classes. New this year was a livestreamed television broadcast on YouTube as a lead-up to the evening. As was true with broadcasts across the nation, Prin @ the Polls awaited final election results late into the night. A faculty panel provided the final wrapup report on PIR, noting what would become key topics of discussion in subsequent days, including the question, What did pollsters miss? Since the election, students involved in Prin @ the Polls have gone on to explore that question and many related ones in class discussion, projects, and presentations. See a curated page of the Prin @ the Polls social media takeover on Instagram and Twitter.